Tuscan estate Ornellaia has highlighted the pre-eminence of London for global wine collectors as it confirmed plans to host a second charity auction in the UK capital this year. Due to be held on 13 November in conjunction with Sotheby’s, the event forms part of the producer’s 25th anniversary celebrations. These centre around its 2010 vintage, which features a limited edition design by Michelangelo Pistoletto, the latest artist to join Ornellaia’s annual Vendemmia d’Artista series. Although the exact line-up for the November event is still to be confirmed, Orsini suggested it was likely to include a repeat of a lot which sold for £22,000 at the May auction. 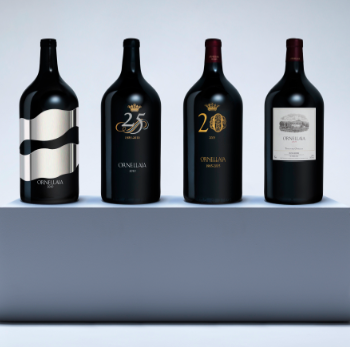 This comprised a collection of four double magnums: a 2010 vintage bearing the mirrored Pistoletto label; a special 25th anniversary label, also from 2010; the third comes from the 2005 vintage, which marked Ornellaia’s 20th anniversary; while the final bottle comes from the 2010 vintage and carries the standard Ornellaia label.